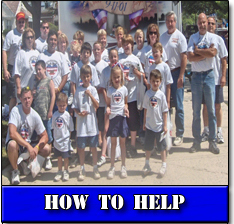 Family & Friends For Freedom Fund, Inc.
Family and Friends For Freedom is a 501 (c)(3) Organization. 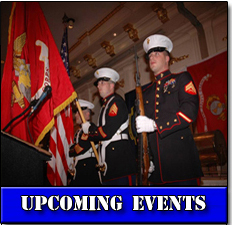 Our mission provides financial support grants to combat wounded service men and women from all branches of the United States Armed Forces. It is with deep sadness I am announcing the passing of Joe Morstatt, Joe was an active member of our Foundation and he will be missed so very much. R.I.P. Joe, we all love you! 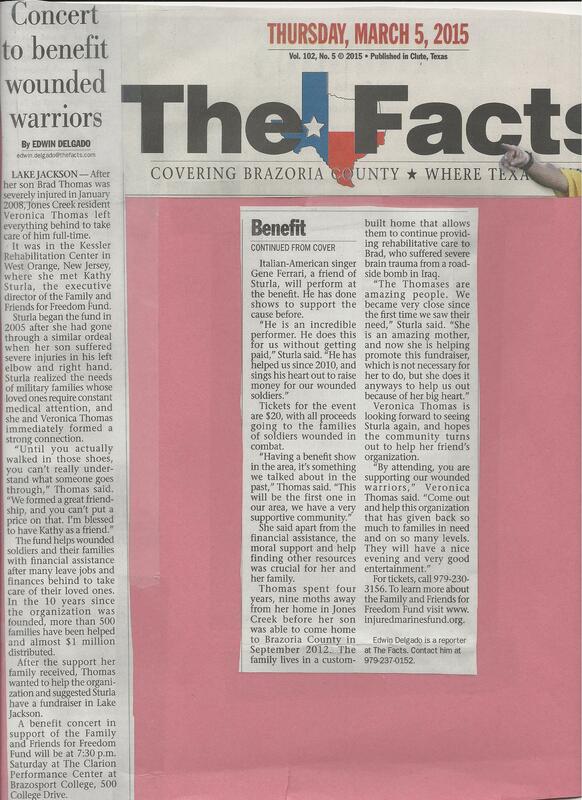 It is with deep sadness I am announcing the passing of Angela Moscatello, Angie was an active member of our Foundation and the most patriotic woman I've ever met. She will be missed so very much. R.I.P. Angie, we all love you! 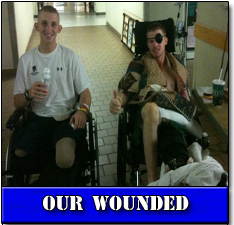 Our severely wounded continue to fight battles here at home with their struggle to adjust to their injuries. 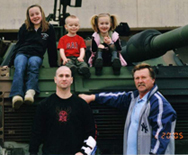 Too often, when a service member is wounded in combat, their entire family shoulders the pain and financial burden. 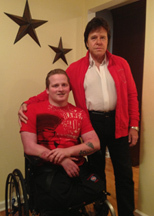 We help to ease the financial worries of our wounded warriors and their families during their long road to recovery. You touched our hearts and you Will Never Be Forgotten. "It is with a heavy heart and great sadness that I inform you that my brave, beautiful boy, after battling so long with his many injuries deployed to heaven. Rip, my Derek. I love you. You will never be forgotten." - Siobhan Mary Fuller, Derek's Mom. Welcome Home SSgt James Sturla! - James Sturla attained his ultimate goal and returned to Iraq to complete a 7 month tour in Fallujah, from September 2006 to April 2007. On September 22, 2004 a Marine in our family was severely injured in Iraq. 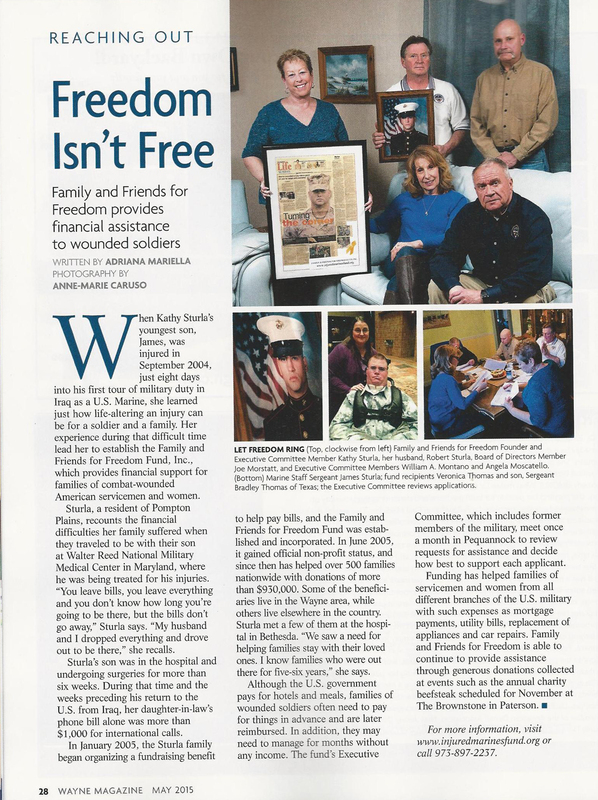 During the 6 1/2 weeks he was at the Bethesda Naval Center we experienced how a family feels and the struggles they undergo when a loved one is injured. The war in Iraq was brought up close and personal. Our marine's arduous journey since has inspired our family and some friends to found a non profit organization called Family & Friends For Freedom Fund, Inc. We felt that we had to help not only "our Marine" but all of the other Marine families that find themselves in this tough situation as well as the Injured Marine Semper Fi Fund. This is how Family & Friends For Freedom Fund Inc., a nonprofit organization, was founded. 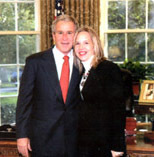 On October 20th, 2006 in Washington DC, Family & Friends For Freedom Fund was invited to meet with the President of the United States of America. The President wanted to thank Family & Friends For Freedom and other military support organizations for the hard work they do in honor of our troops. The single song featured is titled 8 Days. The song 8 Days is based on true emotions and respect for what his brother and all the men and women in the armed forces stand for. 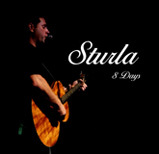 100% of proceeds are being donated by Scott Sturla for Family & Friends For Freedom.